Biotulin – Does It Really Work? What are the Ingredients in Biotulin? Does Biotulin Have Any Side Effects? It delivers ingredients that help un-wrinkle creases on your skin. Improve your skin’s ability to capture and lock in moisture. This product’s primary mode of delivering wrinkle-correcting functions is the use of a plant extract that delivers Botox-like effect on facial muscles. By relaxing facial muscles, your skin also releases tension and stretches out, making your skin appear smoother. It then follows through with rehydrating and moisturizing ingredients that plump your skin and help make it fuller and dewier for hours. Spilanthol: An anesthetic derived from Acmella oleracea (Panacress). It calms facial muscles which, in turn, also relaxes and stretches back skin to help smoothen out wrinkles. It also supports skin reorganization. Hyaluronic Acid: A natural skin component that your skin becomes less efficient to produce with the onset of aging, and this ingredient helps make up for that loss. It helps restore your skin’s natural ability to capture and hold in moisture while also attracting water droplets from the surrounding tissues and air to rest on your skin. Imperata Cylindrica (Blady Grass): This ingredient helps improve your skin’s moisture absorptive capacity and make it last for a full 24 hours. Use this product on thoroughly cleansed and toned skin only. Spread evenly and generously on skin. Allow the product to sink in deeply before layering with other products, including your makeup. This product is packaged in an opaque, 100% airtight bottle. The gel was formulated in the US and manufactured in Germany which helps ensure quality. The formula is transparent, fragrance-free, and made with natural and organic ingredients. The formula was never tested on animals. The formula consists of ingredients that can hurt skin which more sensitive skin types may not respond well too. This product may not be suitable for all skin types, contrary to the guarantees made by the manufacturer. This product appears to have a limited distribution network and may only be available in some countries. For the volume contained in each packaging, this product is more expensive than many of its counterparts. It lacks a good variety of antioxidants to provide damage protection. Does Biotulin Have Any Side-Effects? The manufacturer does not disclose any potential side effect. There are ingredients in the formula, however, that have been associated with negative impacts to skin and health. Alcohol and butylene glycol may damage your skin with regular application, while phenoxyethanol is a neurotoxin. Biotulin may be offering a wrinkle-correcting solution that replaces Botox and which may be hard to resist. However, you need to get down to what exactly it is made up of to make a sound purchase decision about this product. Find out more about what this product is made up of and compare with other wrinkle creams before buying. What is the Price of Biotulin? A 15 g bottle of Biotulin costs $70. Where to buy Biotulin? Biotulin is available for online purchase via the official product websites of the manufacturer and its accredited distributors. Find out if there are distributors in your area and purchase from there to save up on shipping cost. Does Biotulin come with money back guarantee? No, returns are only accepted for damaged and tampered items. Is Biotulin approved by the FDA? Products like this do not require an FDA review and approval to be sold in the market. Who Should Use Biotulin? Women and men alike can benefit from the wrinkle smoothening effect that this product delivers to aging and mature skin. Older individuals, 30 and above are perfectly suited for product use although younger adults who suffer from premature signs of skin aging will benefit just as much from regular product application. 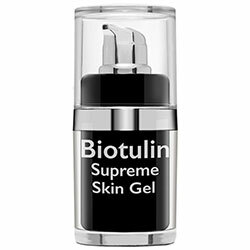 Should I use the Biotulin once or twice daily? For best results, apply the product on face and, if desired, also on neck and chest areas, twice daily. How long does one bottle of Biotulin last?</strong> A little goes a long way so that a 15 g bottle may be able to last you anywhere from 3 weeks up to a month. How long will results last? Results begin to become noticeable in about 28 days of regular and consistent product application. Can I use the Biotulin with makeup? Yes, use a sheer amount and spread thinly but evenly on skin, covering all areas of your face. Allow the product to become fully absorbed by your skin before layering with your makeup.